Indirect magnetic resonance arthrography (I-MRA) confers significant logistical advantages over direct MRA and does not require articular injection. In this study, we determined the diagnostic performance of I-MRA in relation to conventional MRI and arthroscopy or surgery in detecting tears of the glenoid labrum, including Bankart lesions and superior labral antero-posterior (SLAP) tears in a standard clinical setting. Ninety-one symptomatic patients underwent conventional MRI and I-MRA of the affected shoulder, followed by either arthroscopy or open surgery. The scans were interpreted independently by two experienced radiology consultants with a special interest in musculoskeletal radiology. Using the surgical findings as the standard of reference, sensitivity, specificity, and diagnostic accuracy of conventional non-contrast MRI and I-MRA in the detection of labral tears were calculated. The sensitivity of I-MRA was 95 and 97 %, respectively, for two radiologists as opposed to 79 and 83 % for conventional MRI. For both radiologists, the specificity of I-MRA, as well as MRI, was 91 % for detection of labral tears of all types. Accuracy of diagnosis was 93 and 95 %, respectively, for two radiologists with indirect MRA, compared to 84 and 86 % with non-contrast MRI. This retrospective study shows that I-MRA is a highly accurate and sensitive method for the detection of labral tears. The data obtained supports the use of I-MRA as standard practice in patients with shoulder instability due to suspected labral pathology where further investigative imaging is indicated. MRI has an important role in identifying the cause of shoulder instability and helping orthopedic surgeons in deciding who might benefit from surgery. MR imaging for shoulder instability is mostly performed as direct-contrast arthrography due to its higher accuracy over non-contrast MRI . Direct magnetic resonance arthrography (D-MRA), which involves intra-articular administration of gadolinium, has become an established imaging modality for assessing different types of shoulder instability. Most published papers have reported sensitivities and specificities of over 90 % in detecting labral lesions with this technique [1, 2, 3]. An alternative and less invasive technique was proposed over 20 years ago by Winalski , where intravenously administered contrast enhances the joint space and indirectly produces an arthrographic effect. This technique, indirect MRA (I-MRA), has obvious advantages over D-MRA with better patient compliance and logistical preferences to radiology service . A perceived weakness of shoulder I-MRA is the absence of controlled joint capsule fluid distension, which many authors feel is necessary for improving the diagnostic accuracy of subtle labral detachments [6, 7]. This concern led to early recommendations that I-MRA should not be used for the detection of labral tears . There has since been a surprising paucity of widely published research in this area and the true accuracy of I-MRA has not yet been established. A relatively recent and larger-scale study only evaluated superior labral lesions and utilized a non-exercise protocol for the I-MRA . This therefore limits its relevance somewhat as it contradicts the recognized technique described by Vahlensieck, which requires exercise to facilitate contrast enhancement within the joint space . Jung et al. reported a high level of accuracy for I-MRA in detecting labral tears, with no significant difference when compared to D-MRA. However, the strength of these findings was limited by the small sample size, involving only 19 patients and other methodological issues . The purpose of our study, as part of a standard clinical setup, was to determine the diagnostic performance of I-MRA in detecting tears of the glenoid labrum, including Bankart lesions and superior labral anterior to posterior (SLAP) lesions in comparison with conventional MRI and surgical findings. In this retrospective study, we reviewed the records of all patients who had I-MRA and arthroscopy or open surgery of shoulder at our institution between January 2009 and December 2011. The technique of I-MRA as standard practice was agreed between the radiology and orthopaedic departments of North Cumbria University Hospitals. Formal consent was obtained from all patients for iv-gadolinium administration. Those who fulfilled the following criteria were included in this study: (a) I-MRA of the shoulder had been performed according to a standardized protocol at our institution; (b) arthroscopic or open evaluation of the shoulder had been performed post-imaging on the ipsilateral shoulder by a specialist orthopedic surgeon at our institution; (c) the operative note provided precise details of the intra-operative findings, crucially regarding labral pathology. Exclusion criteria were surgery for infection, tumor or open surgery without labral assessment, renal impairment (creatinine clearance less than 30 ml/min), known allergy to contrast agent and pregnancy. Imaging was performed using a 1.5-Tesla Siemens Avanto scanner with shoulder Array coil (four-element coil design with four integrated preamplifiers). The shoulder was placed in the dedicated shoulder coil with the arm in external rotation and hand in supination, with position stabilized by a sand bag in the hand to minimize arm movement. Following standard MRI sequences of the shoulder including paracoronal T1, paracoronal PDFS, sagittal STIR, and axial T2 MEDIC sequences, patients were given an intravenous injection of gadoteridol [ProHance/BRACCO, FAMAR S.A., Ag. Dimitriou 63, Alimos 17456, Athenes, Greece] at a dose of 0.2 ml/kg body weight up to a maximum of 15 ml. Thereafter, patients performed a succession of standard exercises consisting of abduction, adduction, and rotation of the shoulder for 15 min . Post-contrast and post-exercise paracoronal T1FS and axial T1FS images were obtained. Slice thickness was 3 mm and inter-slice gap was 10 % for all settings; the field of view dimension was 160 mm. Table 1 shows MRI imaging protocol details. All studies were reviewed independently by two consultant radiologists with special interest in musculoskeletal imaging with 14 [F.F] and 6 [S.G] years of experience. The radiologists were blinded to each other at the time of reporting and blinded to the results of arthroscopy or open surgery. The diagnostic criteria applied were those described in the literature including high signal in the labrum reaching articular surface, contour irregularity, contrast material dissection into a cleft in the labrum; absence of labrum around the glenoid; marked labral deformation; fragmentation of the labrum; displacement of the labrum from its anatomical position [12, 13]. Figures 1, 2, 3, 4, 5, 6, 7, and 8 show different types of labral pathologies on post-contrast T1 FS images with regards to our diagnostics criteria. Lesions reported on MR were recorded according to their location as anterior, superior, or as a combination of those. The distribution of diagnostics findings and individual reporting are summarized in Table 2. The diagnostic accuracy of MRI and I-MRA for labral tears is summarized in Table 4. Records of the study population were obtained and the operative notes were examined. Labral assessment had been undertaken in all cases using open or arthroscopic means and was clearly documented. Surgery had been performed or supervised by a consultant orthopedic upper limb specialist. Arthroscopic procedures utilized a posterior portal for inspection of the glenohumeral joint and additional portals had been created as required. Open anterior stabilizations utilized a standard delto-pectoral approach. The operating surgeon had been aware of the MR findings at the time of surgery and the presence or absence of labral lesions including their location, suggested by reporting radiologists on the basis of the I-MRA, had been recorded. These surgical findings constituted the reference standard against which MR findings were compared. Data was collated in Microsoft Excel 2007, and further analyzed and interpreted using SPSS Statistical Package for Social Sciences (SPSS) version 17.0 (SPSS Inc. Chicago, IL, USA, 2007). As a measure of exactness, sensitivity, specificity, accuracy, positive predictive value (PPV), and negative predictive value (NPV) were calculated. 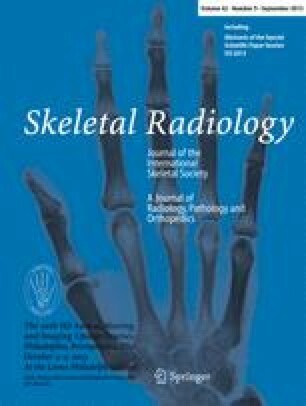 Kappa statistic was calculated to determine the level of inter-rater agreement for the two reporting radiologists. The surgical finding was considered the gold standard. The primary referral indication for I-MRA at our institution was instability (70 patients), manifested by prior dislocation, subluxation, pain, and clicking. Less common indications included painful restricted range of motion (16 patients) and stiffness (five patients). The patient group included 17 women (mean age 35 years; range, 15–70 years) and 74 men (mean age 32 years; range, 16–64 years). Two of the male patients, and none of the female patients, had previously undergone surgery in their symptomatic shoulders—both were anterior stabilizations of Bankart lesions. The MRI reports on the presence or absence of labral pathology were correlated with the intra-operative findings. Of the 91 patients, in 33 patients no labral pathology could be detected during the surgical procedure. In three patients of this group, a labral tear was reported on I-MRA and conventional MRI by both radiologists. These patients underwent surgical intervention due to other pathologies seen on I-MRA including rotator cuff tears, AC joint osteoarthritis with subacromial bursitis, and synovitis, however, the labrum was precisely evaluated during the surgical procedure. Of the 58 who did have labral pathology, diagnosed upon arthroscopy, five had a SLAP lesion and 53 an anterior lesion. In eight patients of this group with surgical confirmation of labral tear, the conventional MRI failed to demonstrate this by both readers, however, the I-MRA correctly diagnosed the labral tear. One SLAP tear was misinterpreted as normal labrum by reader 2 on both conventional and I-MRA. 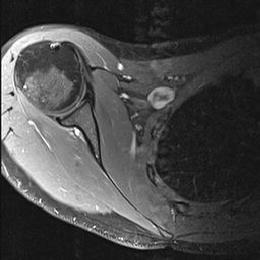 An anterior labral lesion was not identified by reader2 on conventional MRI, however, it was diagnosed on I-MRA. In all other patients, both non-contrast MRI and I-MRA showed a labral tear by both readers. Table 3 summarizes the distribution of diagnostic findings via different modalities. None of the 91 patients experienced any adverse events during the I-MRA protocol. For the calculation of specificity, sensitivity, and accuracy of conventional MRI and I-MRA, the surgical findings were classed as the true result. Table 4 summarizes the findings with specificity, sensitivity, accuracy, positive and negative predictive values for MRI and I-MRA for both readers. In total, with I-MRA, for five patients the diagnostic and surgical findings did not match for reader 1 and for six patients for reader 2. In the two patients that were deemed negative for any labral pathology by I-MRA by both readers, the respective diagnoses subacromial subdeltoid (SASD) bursitis and synovitis were made; however, for the latter, a labral tear was not discounted. In three patients in whom false-positive I-MRA pathology was established, one patient had a full-thickness tear of the supraspinatus tendon, also diagnosed on I-MRA whereas in the other patients no lesion was found during surgery. MRI is a sensitive and highly useful technique in the assessment of shoulder instability. Conventional MR without intravenous or intra articular contrast was shown to be sensitive and accurate in detection of anterior labral tears, but less accurate for superior labral tears . A more recent study by Phillips et al. has also concluded that conventional MR is poorly specific and less accurate in detection of superior labral tears . Conventional MR imaging with 3-T scanners appears more promising. Thomas Magee and David Williams have retrospectively compared non-contrast MR obtained on a 3-T scanner with arthroscopy and demonstrated high sensitivity between 86 and 90 % and 100 % specificity for diagnosing SLAP tears, anterior and posterior labral tears . Our study, performed on a 1.5-T scanner, has shown non-contrast MRI to have slightly lower sensitivity between 79 and 83 % and specificity of 91 % for detection of all types of labral tears. Eight labral tears seen on I-MRA by reader one and nine labral tears seen on I-MRA by reader two were not seen on conventional MRI (Figs. 6 and 7). Direct MRI arthrography is well established for assessment of shoulder instability [1, 2, 16]. Compared to arthroscopy as the gold standard, D-MRA has shown a sensitivity of 82 % and specificity of 98 % for overall detection of SLAP lesions and 66 % of SLAP lesions could be classified correctly . Waldt et al., in a retrospective evaluation of accuracy of MRA in classification of antero-inferior labral injuries, showed a sensitivity of 88 %, specificity of 91 %, accuracy of 89 %, and negative and positive predictive values of 88 and 91 %, respectively . Despite obvious superiority of D-MRA over non-contrast MRI, D-MRA is an invasive investigation requiring intra-articular contrast injection under fluoroscopic or ultrasound guidance, which demands additional radiologist time and expertise. The technique of fluoroscopic guidance is more widely practiced, which requires ionizing radiation. Intra-articular positioning of the needle, although usually safe, may contribute to patient morbidity. In a review of 135 patients who underwent D-MRA, 66 % experienced transient, but significant delayed onset pain in the joint . Indirect MRA with intravenous administration of gadolinium has been investigated as an alternative less invasive technique. MR studies in German academic journals from the late 1990s and 2000 have presented promising results with I-MRA. These initial small studies reported specificities of 85 to 92 % and sensitivities of 90 to 91 % for diagnosing labral tears. Studies have shown that 15 min of exercise following intravenous gadolinium injection prior to MRI, increases signal intensity in the joint and improves the sensitivity in the detection of shoulder pathology [20, 21]. A study by Oh et al., encompassing 36 patients, reported a lower specificity and sensitivity in the detection of superior labral tears, but better results in detection of anterior labral tears by I-MRA . In our study comparing conventional MRI with I-MRA, labral tears were diagnosed with a sensitivity, specificity, and accuracy of 79 and 83 %, 91 % (identical outcome for each radiologist), and 84 and 86 %, respectively, with conventional MRI and 95 and 97 %, 91 % (identical outcome for each radiologist) and 93 and 95 %, respectively, with I-MRA. A prospective study of 35 patients assessed the value of I-MRA with exercise in detecting SLAP lesions and has shown a sensitivity, specificity, and accuracy of 91, 85, and 77 %, respectively . Our study results of I-MRA are largely comparable and better than the earlier results published in the literature. Three patients were incorrectly diagnosed to have labral tear on I-MRA. In two of these patients, subtle enhancement in the labrum was reported as a tear and in another patient a sub-labral recess was mistaken for a tear (Fig. 9). I-MRA has also failed to clearly demonstrate two tears seen at arthroscopy by reader1 and three tears by reader 2. In two of these cases, the tear could be seen retrospectively; in one other case, it was difficult to detect the tear even in retrospect (Fig. 10). A large study comprising 104 patients, comparing non-contrast MRI with non-exercise I-MRA in assessment of superior labral lesions, non-contrast conventional MR has shown accuracy of 70–83 % as compared to 78–87 % for I-MRA. The same study has also shown I-MRA to be more sensitive but less specific than conventional MR in detection of superior labral lesions . Our study, which incorporated a 15-min exercise regime, supports the theory that exercise prior to scanning improves diagnostic accuracy. I-MRA is also reported to be accurate in the assessment of post-operative shoulder. A retrospective review of a small number of patients in assessment of recurrent injury after surgery has shown indirect MR arthrography had 100 % accuracy for recurrent labral tear detection, whereas direct MR arthrography and non-enhanced MR imaging had accuracies of 67 and 75 %, respectively . Our study has only two patients with previous shoulder surgery and in both of these cases, I-MRA and non-contrast MRI have shown recurrent tear by both readers (Fig. 11). The main limitation of this study concerns the retrospective analysis of data obtained in everyday practice. Only patients from one hospital were included. However, the demographics of this cohort were very similar to those reported in the literature; more men than women have SLAP lesions and on average they present in their mid-thirties . In order to be able to draw definitive conclusions on the merits of I-MRA in relation to D-MRA, a comparative prospective study needs to be conducted comparing both techniques. Currently, one such clinical trial is registered on the Web site clinicaltrials.gov . The outcome of this study may provide further evidence to establish whether I-MRA should be replacing D-MRA or if they have an equal level of sensitivity, specificity, and accuracy. If the latter is the case, then I-MRA should have the edge because of a superior safety profile as a procedure and its lesser impact on the logistics within a radiology department. Results from this study match or surpass the sensitivity, specificity, and accuracy of I-MRA reported in earlier published literature. This study provides further evidence that I-MRA performed following standard exercise is highly accurate in diagnosing labral tears and can be a very useful tool in assessing patients with shoulder instability. We are grateful to Mr. Arvind Desai for assisting in collection of some of the orthopedic clinical data. Furthermore, we are indebted to Mr. Guy Broome, Mr. David Mackay, and Dr. Peter Jennings, without whom the I-MRA pathway could not have been successfully implemented in our Hospital Trust. A comparison of indirect and direct MR arthrography of the shoulder using arthroscopic correlation (sponsor: Milton S. Hershey Medical Center), http://clinicaltrials.gov/ct2/show/NCT01416740, last accessed 2 July 2012.